Another type of natural suppression is in the physical realm such as where the menses are checked by injudicious bathing, or the lochia stopped after labor by catching cold, or milk suppressed, or perspiration suddenly inhibited by chilling. 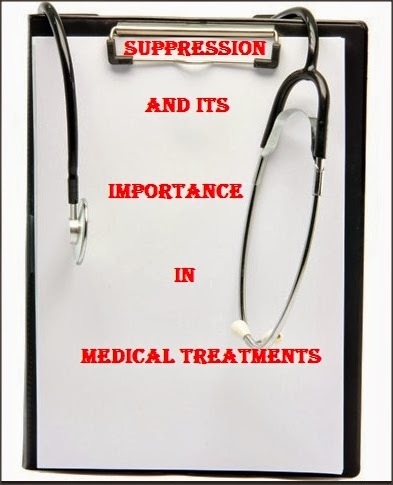 Then there is also a type of suppression of one disease by another, This may take the form of an acute disease being held in abeyance by another acute one until the "cure" of the second; or it may be an acute disease suspending a chronic until the acute course is run. The reverse of this, where a chronic disease holding sway, gives a partial or full measure of immunity against acute disease, could really be classed as suppression although it is more usually thought of as immunity. The suppression of a diarrhea will often produce constipation, then fever and a tendency to delirium. The present indiscriminate use of the external applications in rheumatic and allied states invariably sends the trouble to the central organs, especially to the heart. The present-day pain relievers, and the consequent indiscriminate use of such preparations is exceedingly harmful, for it suppresses the danger signal of pain but never removes it, rendering it possible to appear in a much exaggerated and more dangerous manifestation in some other organ, or in a much more serious condition in the same organ. Another form of suppression that is very frequently seen is the external application of drug preparations for the removal of skin manifestations, such as eczema, scabies, impetigo, psoriasis. These skin manifestations can be removed by the external use of drug preparations. This, however, does not cure the diseased condition, but blunts the disease, and it surely will still be present in the organism and express itself in some deeper and more vital part, and a more important organ and ruin the organism itself. The danger from these suppressions is very great, for the longer they are suppressed the more likely they are to take on nervous and mental manifestations, striking at the very seat of life and reason, and there expressing itself. Coryza and sinus troubles treated by local applications, leucorrhoeal and gonorrhoeal discharges by antibacterials and antifungals are also suppression. The rashes due to the exanthemas from viral infections, driven in by the unwise use of cold packs, conjunctival pus by silver salts; ulcers by various local dressings, and warts by acids, electro cautery etc may also be classed suppressions .We have further the local suppression of many conditions by the different lamps, violet ray therapy, etc. Another source of suppression is the attempt to suppress the natural secretions of the body, like the perspiration in the armpits and the perspiration of the feet, by the use of medicinal powders. This forbids the elimination of waste matter through the natural channels and this waste must be taken up in other parts of the body and the attempt made to eliminate them through these other channels. In this way much harm may be done, and while the local suppressions may be entirely successful, the constitutional manifestations are dangerous to health. It is the privilege of the homoeopathic physician to relieve these distressed conditions and to set the vital energy in order, thus enabling it to function properly. The homoeopathic physician is the only physician who is equipped to deal with these conditions, for his province and the fundamental principle of his work is the proper co-ordination and normal functioning of the body, the mind and the spirit; and it is only when the three spheres of man co-ordinate to develop in their normal way that harmony and health can be maintained and preserved. Most insidious of all are the suppressions by vaccine injections which are now prevalent that a child may take seven or eight different kinds in a year.